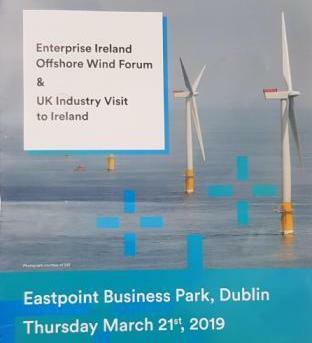 Geomara were delighted to attend and present at the Enterprise Ireland Offshore Wind Forum held in the Eastpoint Business Park in Dublin on Thursday March 21st. Geomara are members of the Enterprise Ireland Offshore Wind Cluster which was promoted throughout the day. The event was launched by the Minister for Communication, Climate and Action and Environment, Richard Bruton who also gave the keynote address. Alan Duncan from Scotia Supply Chain gave a really informative overview of the UK Offshore Wind Sector. The presentation gave some indication of the opportunity for Irish companies to engage with the UK supply chain as the industry attempts to meet some ambitious targets for offshore wind up to 2030. A number of Tier 1 offshore wind developers gave their perspective on projects completed and in the pipeline. Geomara gave a presentation in the afternoon on our offshore wind surveying services and our experience working on Eon’s fleet of offshore windfarms. We were thrilled to represent along with other wind cluster members the expertise available in the Irish supply chain. Overall it was a great day with lots of stimulating presentations and potential exciting opportunities for Irish companies looking to enter the UK market. Thanks to the Enterprise Ireland team ( Liam Curran, Darragh Cotter and Conor Stone) for putting together a great forum with lots of useful information and great networking opportunities. 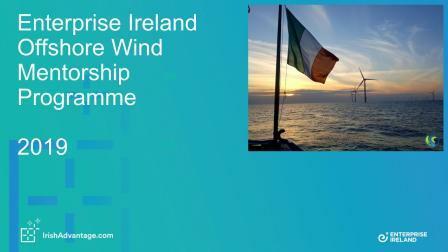 We are delighted to announce that following an application process Geomara have been selected to participate in the inaugural Enterprise Ireland Offshore Wind mentorship programme. The program is focused on technical and commercial feedback. This includes value proposition, technical innovation, route to market, competition and market position definition. Geomara have been partnered with Alan Duncan from Scotia Supply Chain. We are really looking forward to engaging with this opportunity.